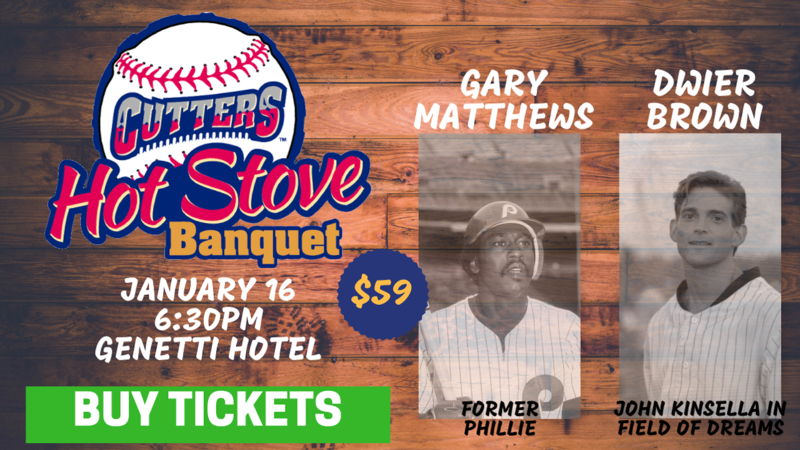 The Williamsport Crosscutters have announced their 13th Annual Hot Stove Banquet will be held on Wednesday, January 16 in the Grand Ballroom of the Genetti Hotel in Williamsport. The event is presented in part by Panda Patriot Power, River Valley Transit, WRAK 1400AM, and the Williamsport Sun-Gazette. Guests at this year's event include former Phillies outfielder Gary "Sarge" Matthews and from the Academy Award nominated movie "Field of Dreams", actor Dwier Brown. Additional special guests will be announced in the coming weeks and a portion of the proceeds from the event will benefit a local charity. .
Matthews, a first round draft pick of the San Francisco Giants in 1968, hit .281 in his 16-year major league career with 234 home runs and 978 RBI's. He played with the San Francisco Giants (1972-1976), Atlanta Braves (1977-1980), Philadelphia Phillies (1981-1983), Chicago Cubs (1984-1987) and Seattle Mariners (1987). Matthews was the National League Rookie of the Year in 1973 with the Giants and the MVP of the National League Championship Series in 1983 with the Phillies. After his playing and coaching career, he was a popular broadcaster for the Phillies from 2007-2013. The evening will consist of a full-course dinner, live and silent auctions of sports memorabilia along with interviews and question and answer segments with the special guests. Additionally, Brown will speak about the making of "Field of Dreams" and the special bond between fathers, sons and the game of baseball. Other highlights of the event include the inductions of the latest members to the Bowman Field Hall of Fame and the Lycoming County Sports Walk. Those inductees are expected to be announced in the weeks leading up to the event.